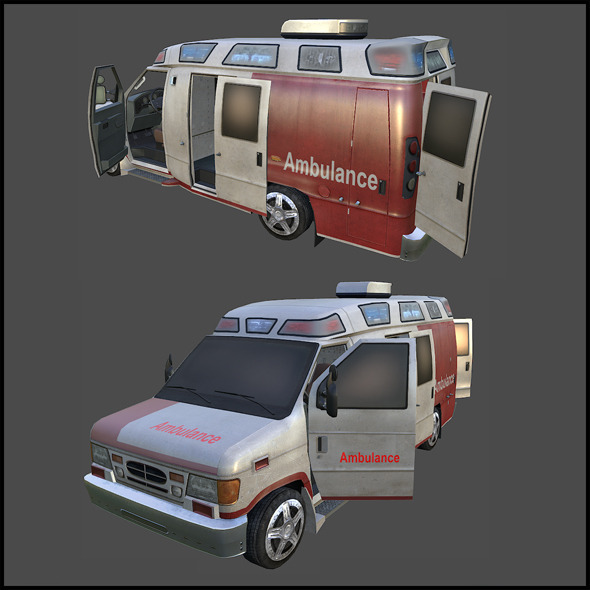 3D model of a ambulance car for your games/media productions. This is a high quality, low polygonal model, with fully modeled interior, easy to animate. Animated: No; Low-poly: Yes; Materials: Yes; Rigged: No; Textured: Yes; UV Layout: Yes; 3D File Formats Included: .3ds (multi format), .dxf (multi format), .fbx (multi format), .max (3ds Max), .obj (multi format); Created In: 3ds max 2012; Geometry: Polygons; Poly Count: 3800. Keywords: ambulance car, dxf, fbx, files, included, max, model, obj.